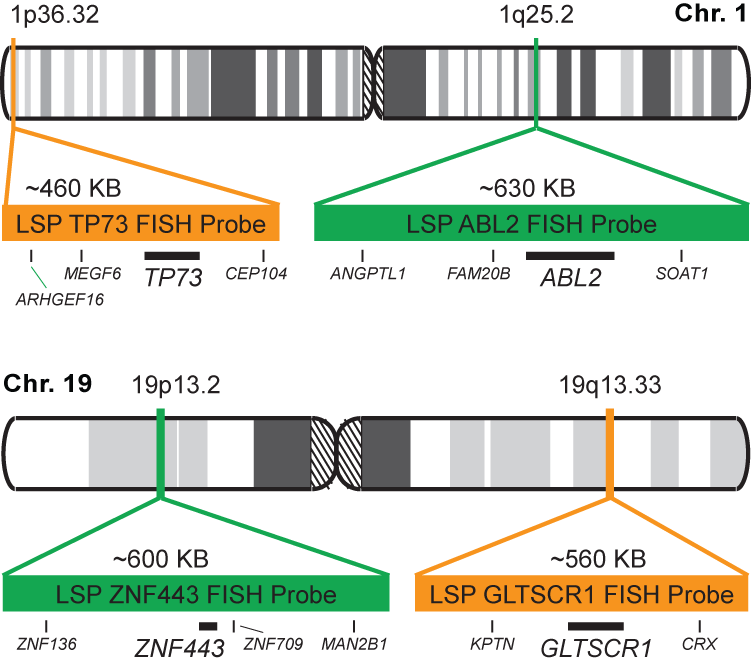 The TP73/ABL2, GLTSCR1/ZNF443 FISH probe set is designed to detect copy number changes in the region of the human TP73,ABL2, GLTSCR1 and ZNF443 genes located on chromosome band 1p36.32, 1p25.2, 19q13.33 and 19p13.2, respectively. The kit contains 4 differentially labeled probes: A Locus Specific Probe (LSP), TP73, covers a chromosomal region which includes the entire TP73 gene; the LSP ABL2 covers a chromosomal region which includes the entire ABL2 gene; the LSP GLTSCR1 covers a chromosomal region which includes the entire GLTSCR1 gene; the LSP ZNF443 covers a chromosomal region which includes the entire ZNF443 gene. The probe is labeled with CytoOrange and CytoGreen. CytoOrange is a fluorophore with an excitation peak at 551 nm and emission peak at 575 nm, giving it an orange fluorescent signal with an appropriate filter; CytoGreen has an excitation peak at 495 nm and emission peak at 518 nm, giving it a green fluorescent signal with an appropriate filter.